Do you know what makes an unforgettable Christmas? It’s the love, kindness, and compassion you give while decorating the house. Christmas decoration should be done in such a way that it arouses the festive spirit in anyone who sees it. 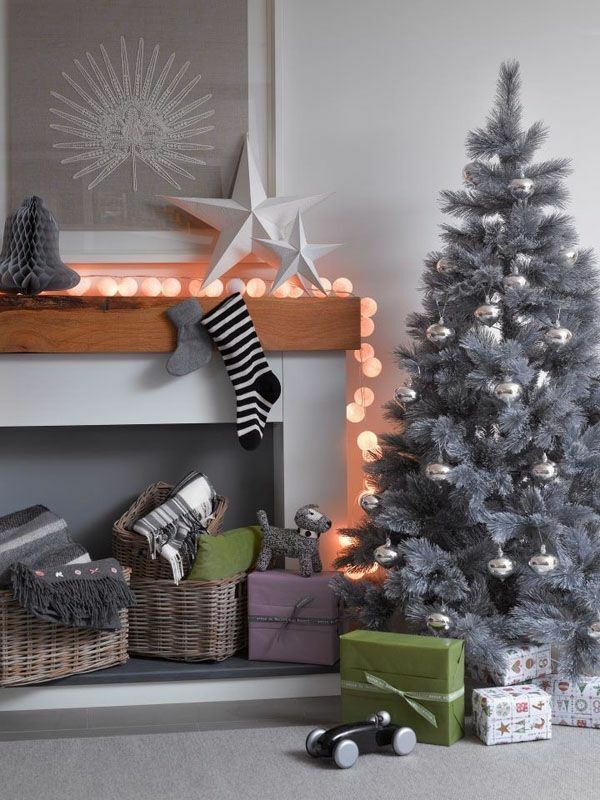 Every year we see new ideas and themes for Christmas decoration. So why don’t you opt for something entirely different and unique this Christmas? We feel that modern decoration idea would be your best bet for 2016. 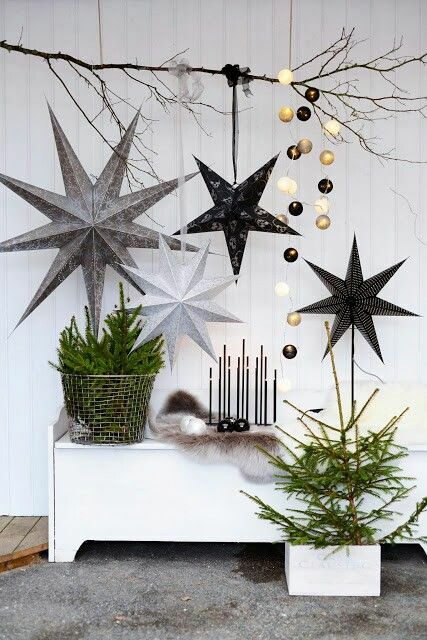 It gives a contemporary touch to the Christmas decoration with minimal touches. 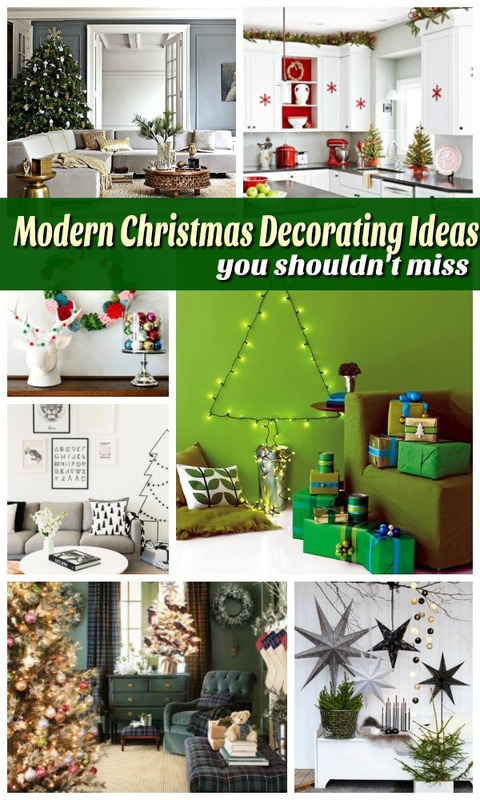 So be merry and happy with our modern Christmas decoration ideas. We hope they can inspire you as much as they inspired me. 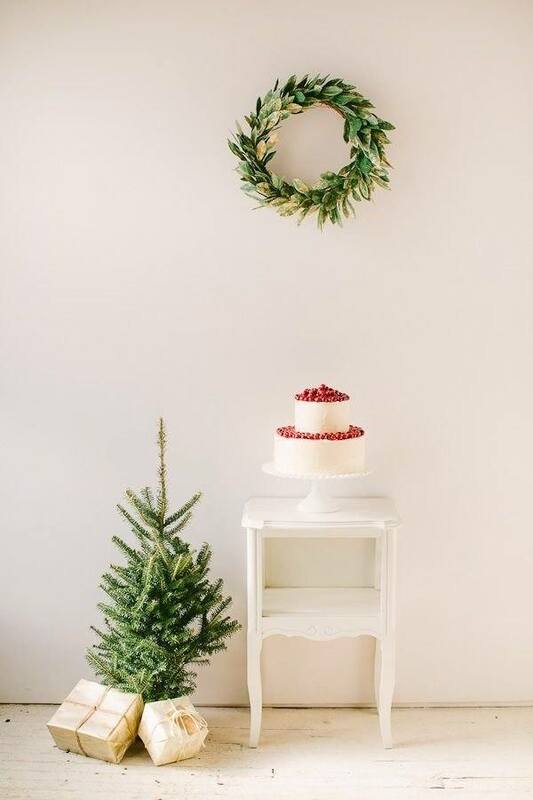 When you’re decorating the living room for Christmas, you need to pay little bit attention to the nicks and corners of the house as well. The neutral color palette used is also very pleasing to the eye. 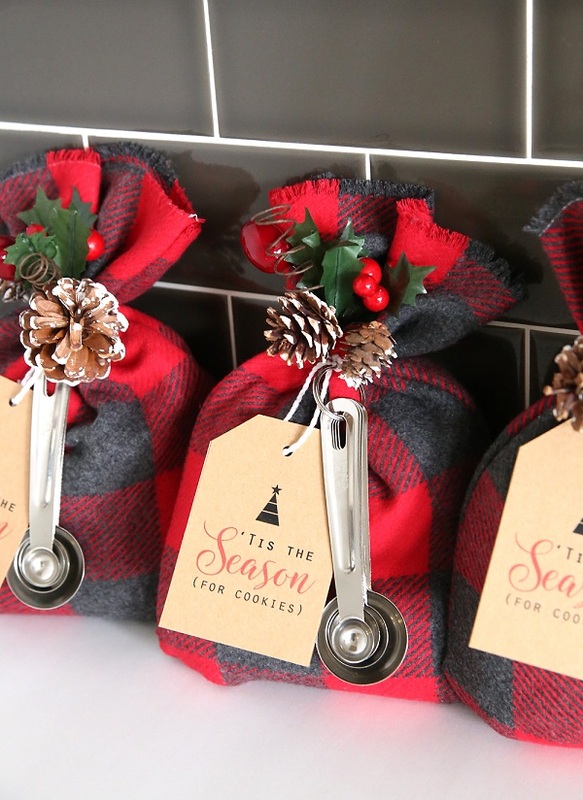 This is one of the most modern Christmas gift favor ideas. 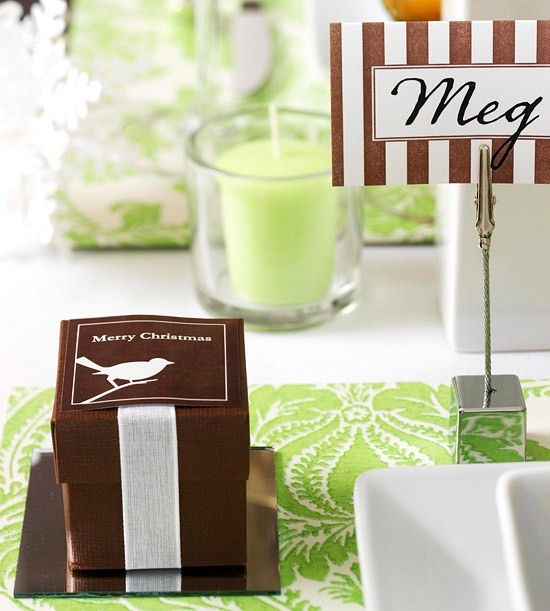 Place the chocolates in a readymade box and tie with a ribbon along with Yuletide greetings. The decoration is minimal, but the effect it is putting is significant. 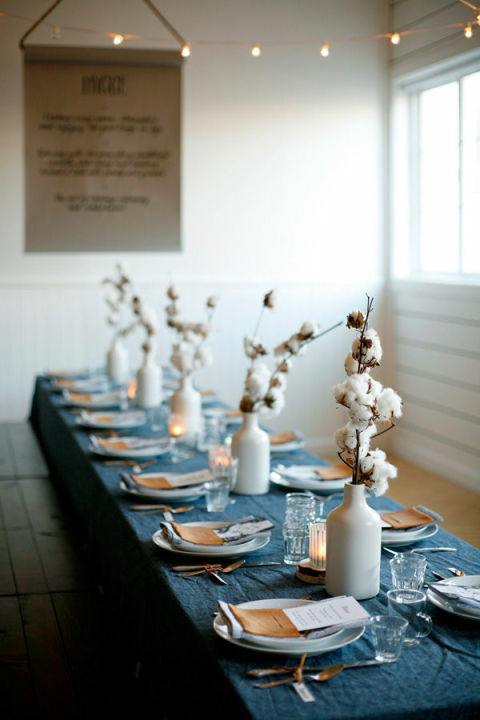 We loved the soothing color combination used in this picture. 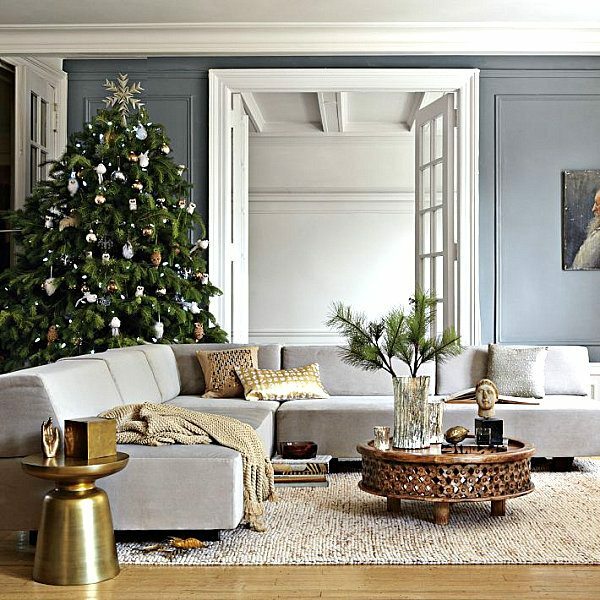 This simple and modern Christmas living room design is one of our favorites. We loved the wall Christmas. And the cushion cover is also looking festive. 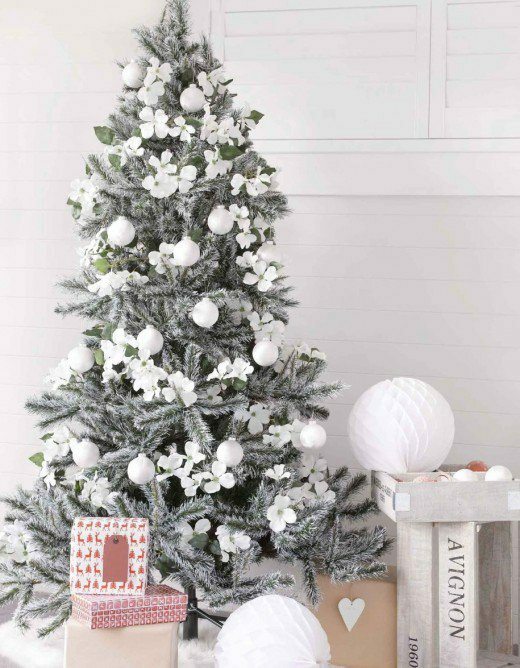 In this beautiful decoration, the Christmas tree will take home all the attention. The furry elements are adding a perfect warmth and depth to the décor. The chandelier is adding a further dimension to the décor. The vignette here is a perfect mix of modern and rustic. The little amount of greeneries used in this décor is making a strong impression. 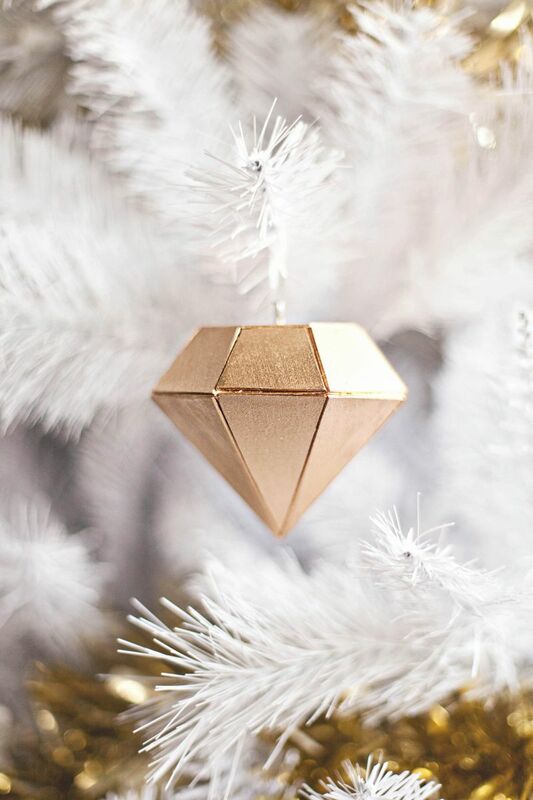 This ornament is so beautiful that we find hard to believe that it’s so easy to make. 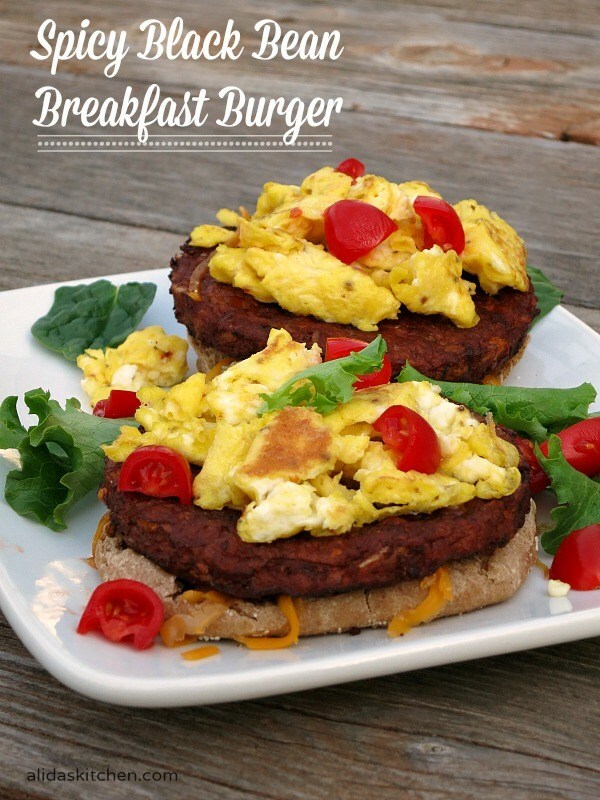 It will complement your modern décor really well. 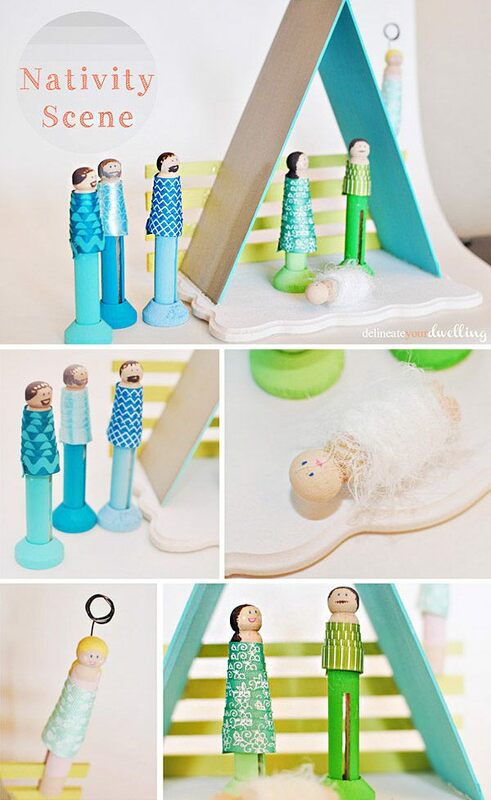 This modern nativity is so adorable that we wouldn’t mind even the children playing with it. Even the color combination is very fresh. 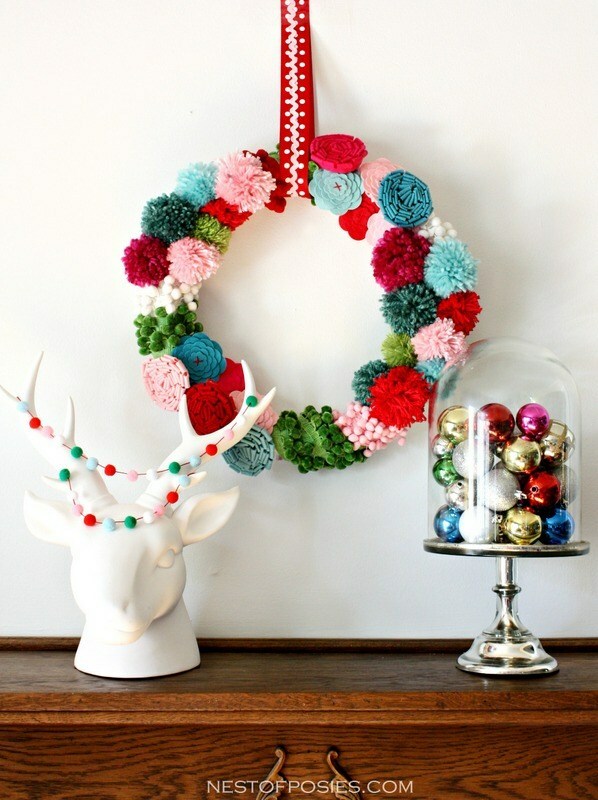 We loved the bright colors used in this wreath. Even the garland on reindeer antlers is complimenting it very well. 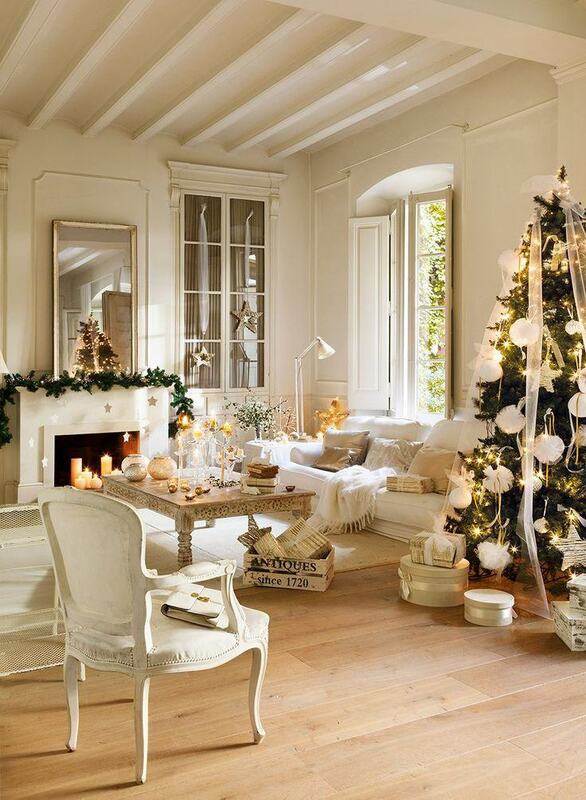 This elegant and modern room design, in gold and white theme, will help you recreate a fairytale décor for the Christmas. 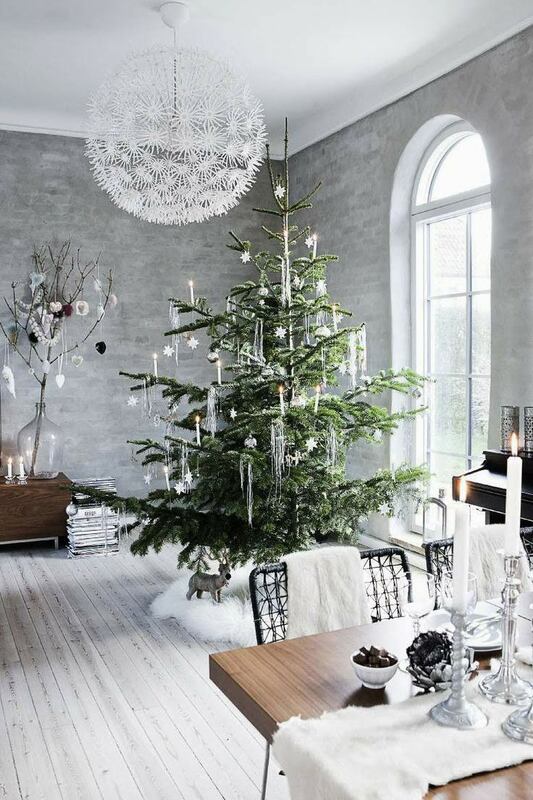 The delicate tulle is giving a Nordic look to the room. Instead of garlands, trees, and ornaments, how about extending the magic of gold and silver to the tabletop as well. These shades will accentuate the look without stealing the show. 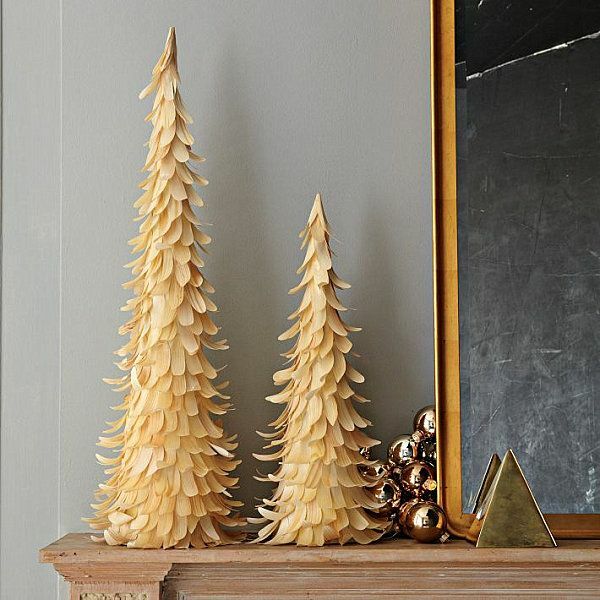 If you like earthy more than shiny, use this wooden chip Christmas tree for decoration. The golden touches are like icing on the cake. This has to be the most unique of all the advent calendars we’ve seen in a long time. 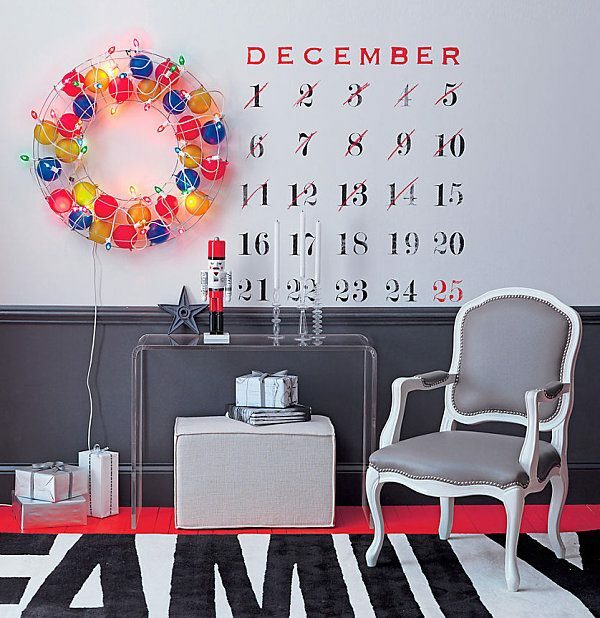 Even the metal wreath filled with lights is creating an eye-catching look. Just because it’s Christmas, doesn’t mean you cannot experiment with colors. The blogger here has opted for an entirely unique color combination, teal and off white. 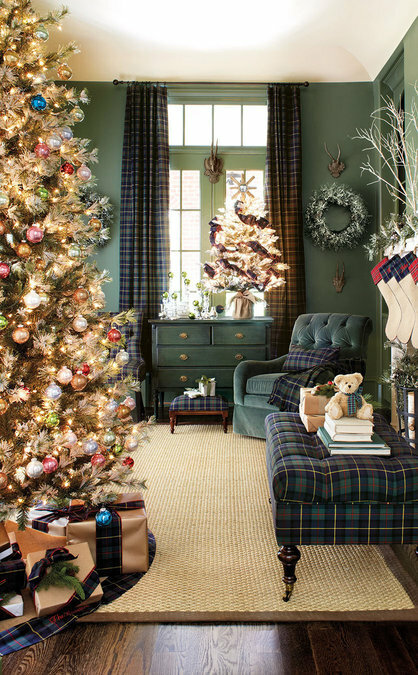 This living room, decorated with glittering snow and the tartan plaid is a perfect blend of modernity with traditional. 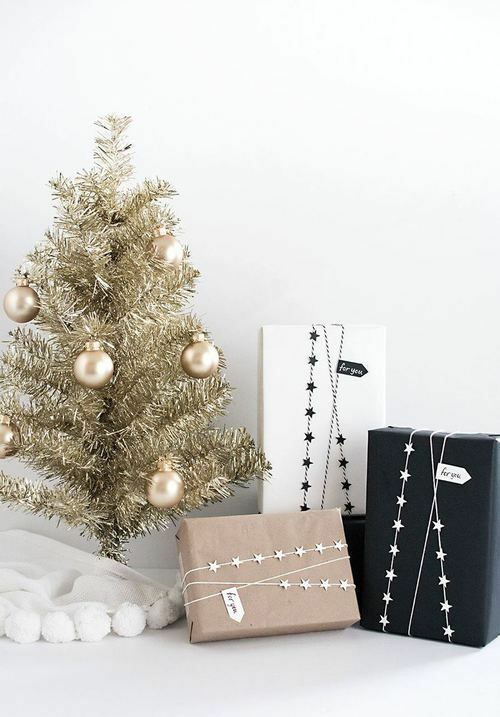 The gifts here are waiting to be unwrapped by you. 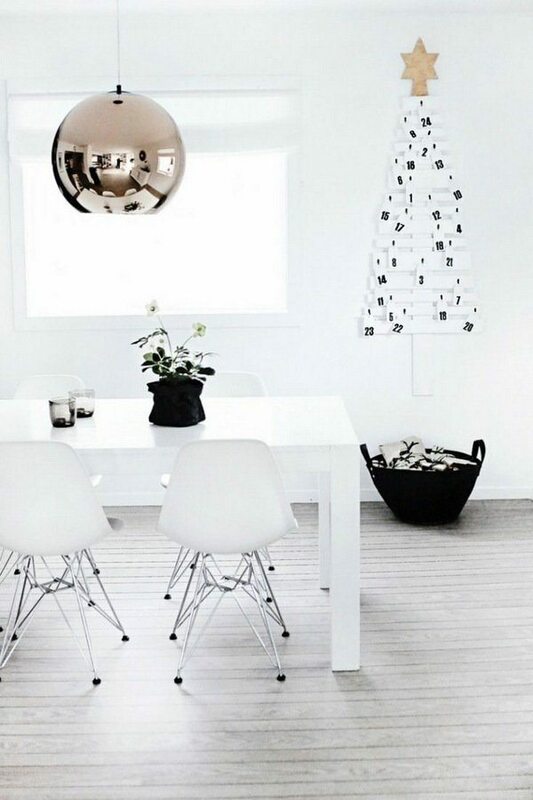 Black and white is the best modern decoration combination for you to try. The advent calendar is unique, and the lampshade hanging from the ceiling is giving the view of the entire house. 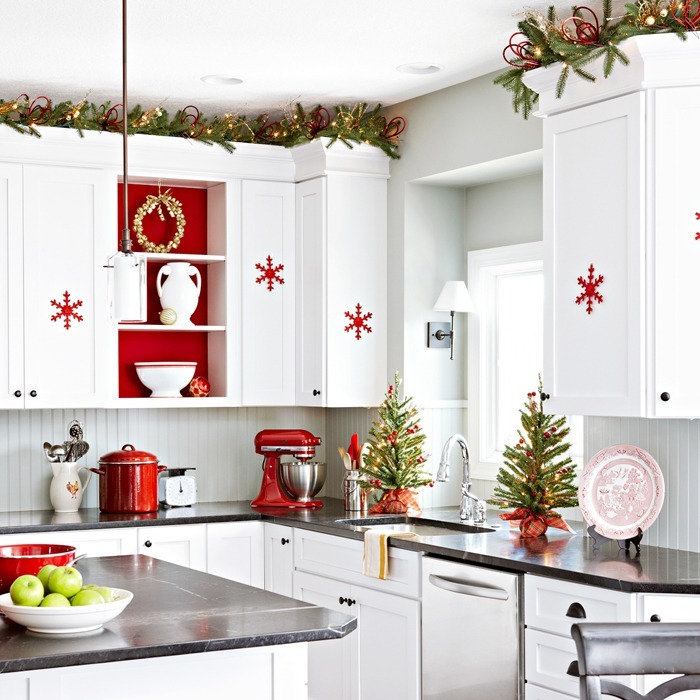 A pristine white kitchen is given a festive look by adding red elements. The red snowflakes, especially, are giving a Christmassy look to the kitchen. The faux flowers are creating a soft and dramatic look to the décor. Opt for pastel shades or whites to give a modern look. 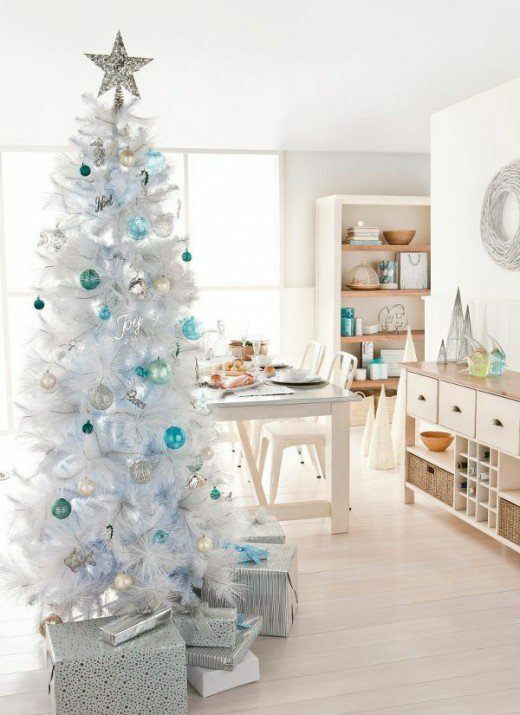 This white Christmas tree is adorned with bright blue ornaments to create a strong statement. You’re free to pick any color you like for the ornaments. 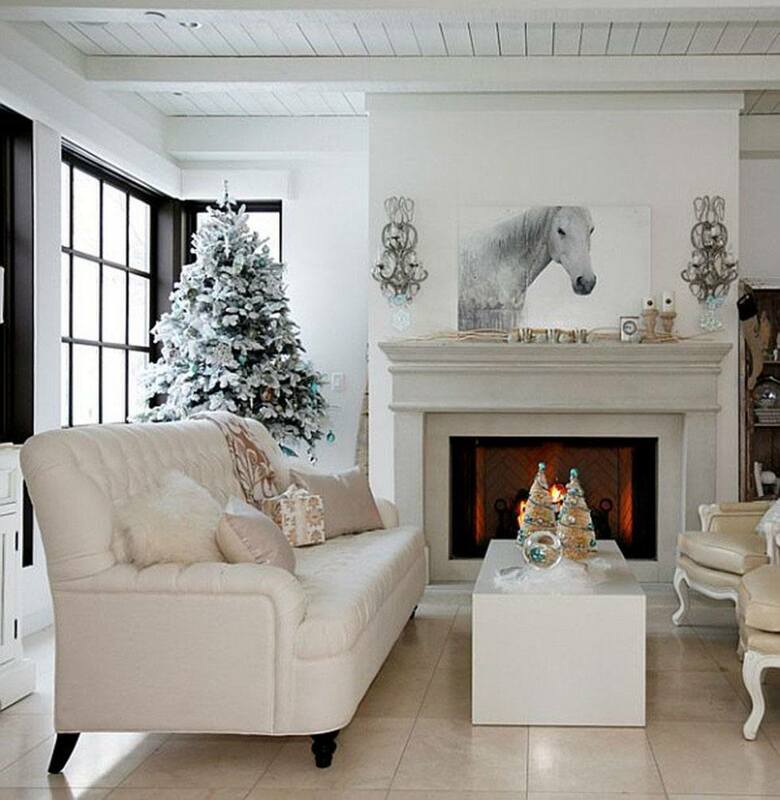 The picture of the horse above the mantelpiece is the highlight of this living room. If the face still feels empty, place some candles on the mantelpiece. 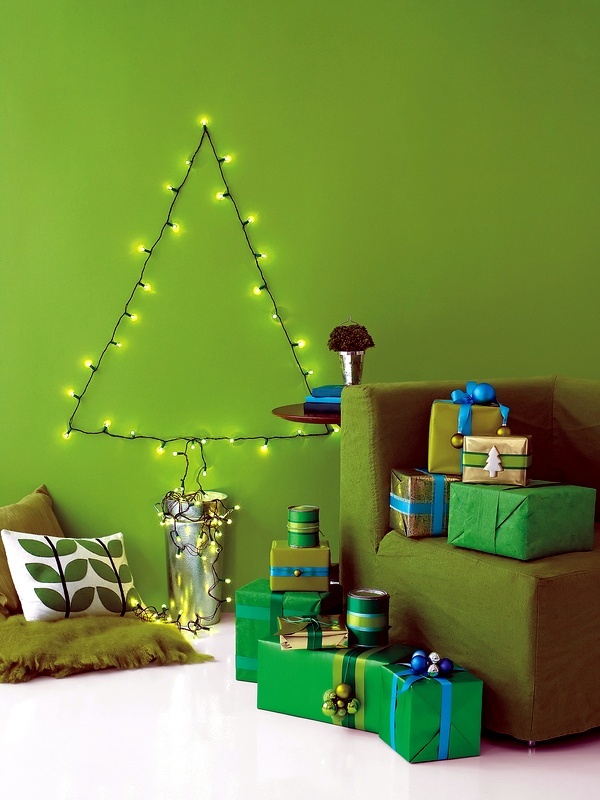 Instead of opting for a full-fledged Christmas tree, opt for a minimalistic approach for the yuletide season. An earthy hue is the best way to deviate from traditional decoration and create a modern look. 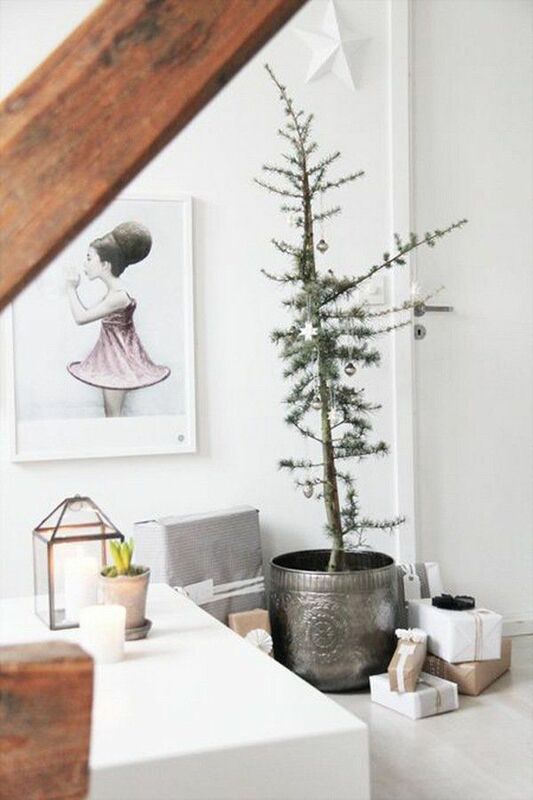 Here’s another excellent Christmas tree alternative. It is especially effective if you’re in short of space. 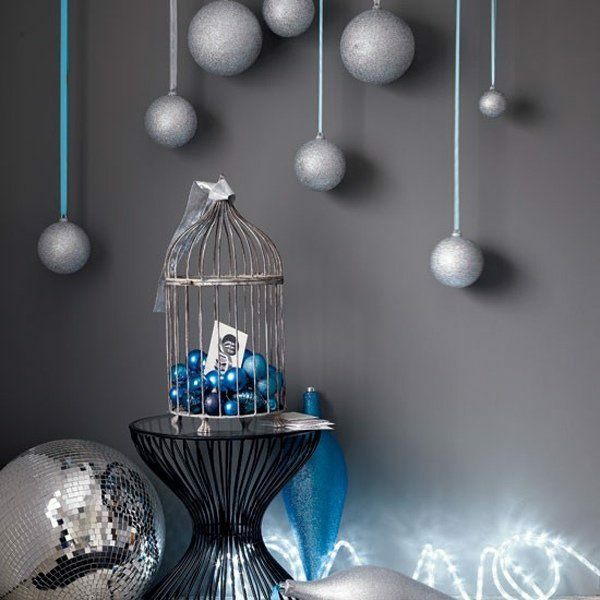 How unique is the idea of putting ornaments in a cage and placing it for display? The baubles hung from the ceiling are also giving a unique look. Mood enhancing lights, along with mirrors can give an elegant and sophisticated look to the living room. Not a typical décor, but very distinctive. 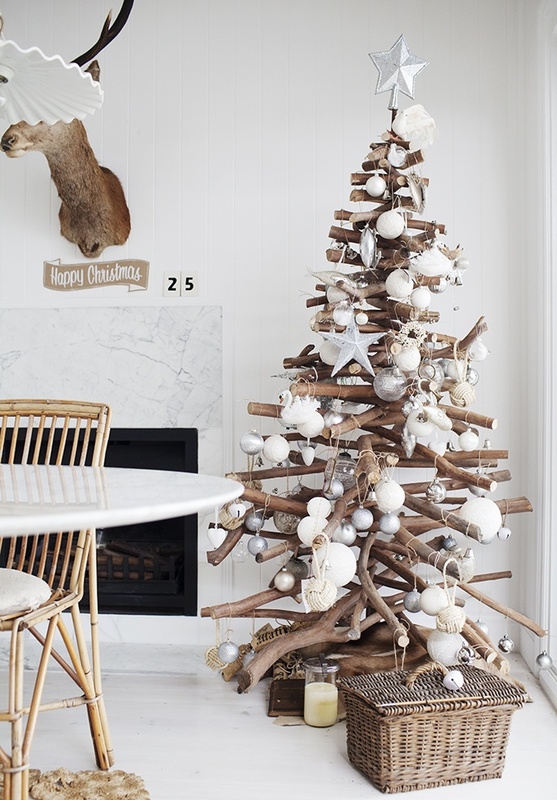 This wooden Christmas tree will always be on top of our list in terms of modern decoration. The white ornaments are giving a perfect touch to the tree. The modern decoration is the best pretext for using a neutral color palette for decoration. And contrary to what most of the people say, it doesn’t look dull even a wee bit. 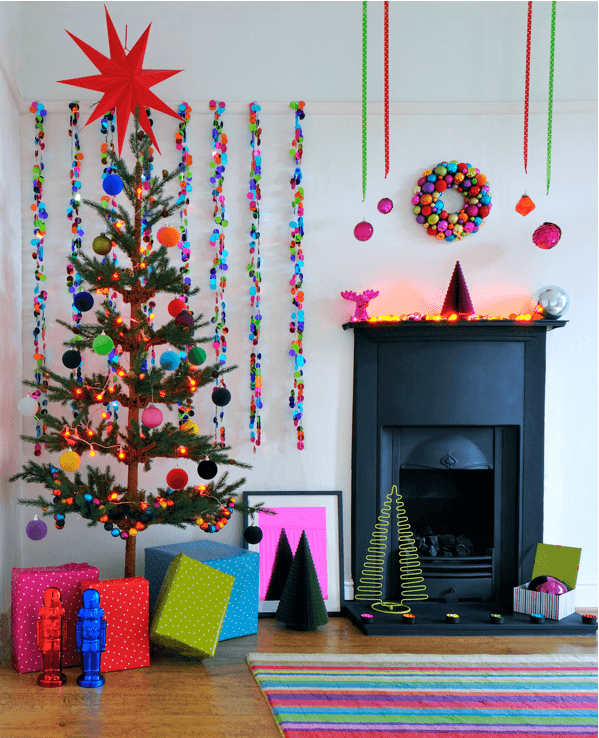 If you’re bold enough to experiment with colors, try replicating this awesome decoration idea. It will look amazing against white walls. 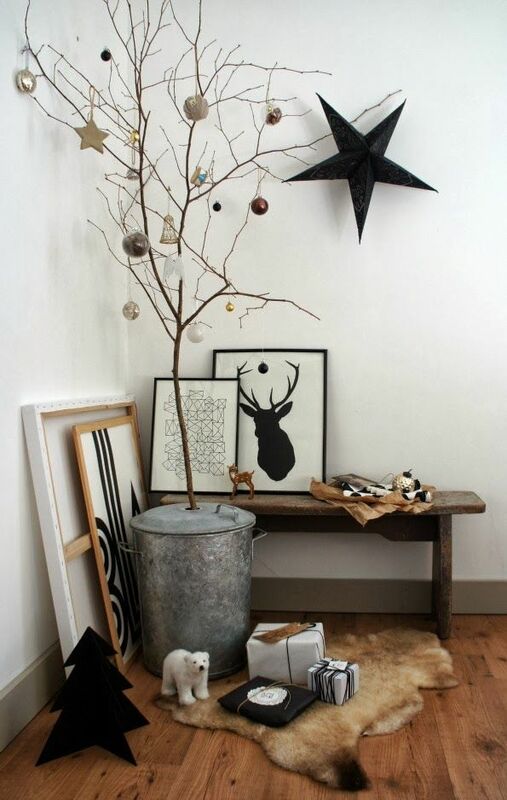 A tiny golden tree with golden ornaments are what you need to create this look. The star ribbons are indeed unique. This one is festive, but with a modern look. 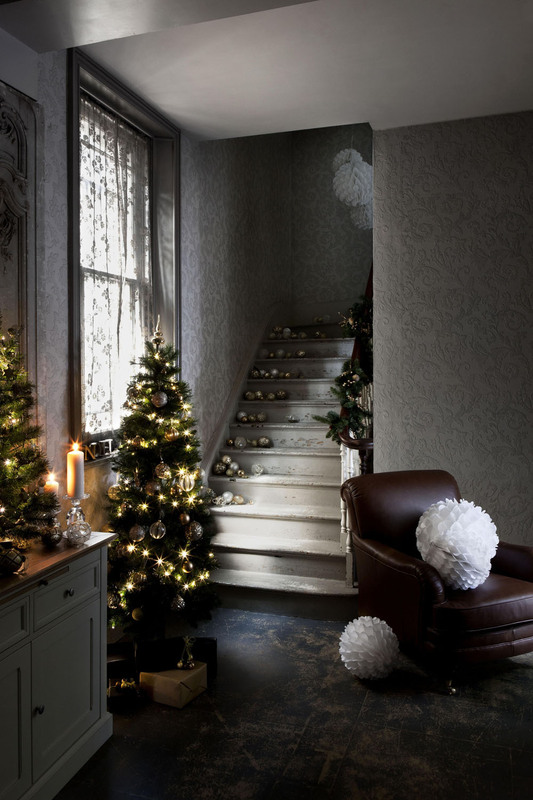 The stockings, hung from the staircase along with an evergreen garland is an excellent way to bring outdoors home.